According to the U.S. Census Bureau report that covered 2008 to 2012, nearly 10.5 million seniors age 65 and older say they have difficulty walking or climbing. Since a loss of mobility can mean the end to an active life, mobility aids such as scooters or electric wheelchairs can be the difference between being independent and feeling like you’re under house arrest. Scooters 'N Chairs is an online retailer for mobility products. It sells mobility scooters, electric and manual wheelchairs, lift chairs and more. Choose from nearly 100 models of mobility scooters and electric wheelchairs from over eight brands. Justin Lubomirsky and Scott Zabriskie started Scooters ‘N Chairs because they saw that the need for affordable mobility aides being sold by a company that puts care and compassion first was needed. By combining mobility experts to find products and an easy-to-use website, Scooters ‘N Chairs offers a simplified online shopping experience with high-quality mobility scooters and wheelchairs. 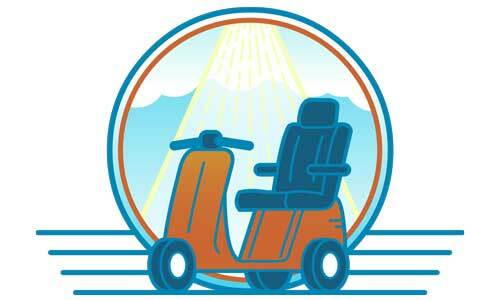 Scooters ‘N Chairs is an authorized reseller for several major names in mobility like Carex, drive, EV Rider, graham field, merits, SHOPRIDER and more. This means that every purchase comes backed by a full manufacturer’s warranty. Ground shipping in the continental U.S. is always free and financing is available through Klarna with special deals like six or 12 months same as cash. The company’s return policy is very straightforward and covers the first 30 days. Lift Chairs: Lift chairs mimic recliners in that they look like a regular chair but they come with the ability to raise and lower for easier sitting and standing. As technology changes and manufacturers bring out new offerings regularly, the product line from Scooters ‘N Chairs is subject to change. Their current line-up gives you a good idea of how vast their offerings really are. Scooters ‘N Chairs has nearly 100 models of mobility scooters and electric wheelchairs available. You’ll find mobility scooters and electric wheelchairs from over eight brands including, Drive, Pride Mobility and EV Rider. Here is a snapshot of some of their scooter and electric wheelchair models, along with a price range of what you can expect to pay. Price depends on each model’s features and accessories. Scooters ‘N Chairs includes a “Budget Scooters” section on their website. This section has mobility scooters right at or under $1,000. One of the ways that Scooters ‘N Chairs keeps their prices low is by not having the overhead that comes from a physical storefront. They are so sure that you won’t find a better deal out there that the company offers a low price guarantee. If you find a better price on your product within 30 days of purchase, they’ll not only refund you the price difference, they’ll also throw in an additional 20 percent off the difference. The internet-only store has an easy-to-maneuver checkout process with no hidden charges and your product will arrive from three to 10 business days after your order is placed (as long as it’s in stock). Most of the time, it will be fully assembled, so the most you’ll have to do is connect the batteries and release the seat. Likewise, you must have a return authorization number before you can return your item. To get a return authorization number, call the Scooters ‘N Chairs support number (800-674-8395) or email them at [email protected] You’ll also be given a return address. How long do Scooters ‘N Chairs mobility scooter batteries generally last? Gel batteries, which are the type of batteries that Scooters ‘N Chairs products come with, generally last anywhere from 12 months to three years but there are many variables that can shorten or lengthen the lifespan such as use, the weight of the person using the scooter and the terrain being traveled over. How far do the mobility scooters sold by Scooters ‘N Chairs go on a full charge? The majority of medium-sized scooters with two 12-volt, 11-amp Gel batteries will last through 15 to 20 miles of use. The type of terrain and the weight of the rider can lengthen or shorten the range. Most scooter models sold by Scooters ‘N Chairs can be fitted with larger batteries if there is a need for more range. How do you place an order on Scooters ‘N Chairs’? You can place your order online on the Scooters ‘N Chairs website. All orders are reviewed by a Mobility Specialist to make sure you’re getting the correct item. What is the difference between a Rollator walker and a standard wheeled walker sold by Scooters ‘N Chairs? Standard wheeled walkers have two legs in the back and two wheels on the front whereas Rollator walkers have three or four wheels and many models have a seat, allowing users to sit any time they need to take a break. How much is shipping with a Scooters ‘N Chairs order? Shipping is free on all orders within the Continental United States. Do all orders come assembled? Scooters and power chairs arrive pre-assembled. You’ll only need to connect the batteries and release the seat so it can be adjusted. Some lifts and carriers require a minimum amount of assembly. The team at Scooters ‘N Chairs understands that you can’t put a price tag on the freedom that comes from living a life without restrictions caused by mobility issues. They work to keep their costs down without cutting corners on quality or service. From the most basic questions that come from someone just beginning their search for the right mobility aid device to the more in-depth questions that come once the type has been decided on and the small details need focus, there is someone available to answer them all seven days a week from 8 am to 5 pm EST either on the phone or in chat. If you’re interested in learning more about Scooters ‘N Chairs’ products, call 888-966-9104 or visit their website for more information.